Through an opportunity at work I got to be part of the team working at one of the largest game events in the world. We flew from Ireland to Holland, then from there to Germany via train in just over 10 hours (with a couple of delays - I definitely didn't get off at the wrong stop in Amsterdam!). First port of call in Cologne was to get a well deserved ice cream after that travelling while found our bearings. I've been to Cologne before many years ago, yet still the Cathedral still wowed me with it's sheer scale. Our hotel was just around the corner from it so it was great to take a look around before our first day at the conference hall. Our first day working was on 'Press Day'. This is was mostly media/journalists along with some super dedicated gaming fans who bought an early bird pack. This was a great time for orientation as the venue was huge! Our own area was massive, easily fitting a few hundred pcs for the main attractions. Even with that taken in to account walking around and seeing full scale planes, tanks and cars fitting easily in to display stands was crazy. I had a half day so used the time to go exploring. Here's what I found. A full esports area, for pro-level tournaments, exhibitions and challenges. Halls wall to wall with video screens, giant stands (to cover censored game content), amazing promo statues, stacks of peripherals, gear and loot for hungry fans. Suddenly queues started to appear the day after Press day. It was now open for everyone. Queues were over 3 hours for some games and walking through the halls at times felt like paddling up stream through rapids. I didn't have as much time to go around the halls in between breaks but most people were really nice that I managed to talk to. Gamers came from all over Europe and despite the language barrier they were able to share their love for games. On the Thursday of the expo Blizzard showed the World Première of the cinematic to the World of Warcraft expansion; Warlords of Draenor. I couldn't have imagined the scale of the crowds. The booths we were working in became fully blocked as people queued around them awaiting the cinematic. Thousands came to view it. It was an incredible thing to experience for the few hours the event was on. After the cinematic things didn't slow down for the rest of the event. There were lots of other events going on around each of the halls. Challenges, giveaways and competitions. Not every day do you get to see someone doing a push-up challenge on top of a tank! It was so hectic but such an enjoyable kind of busy. Every day we could barely walk at the end of it, yet we managed to hobble our way to the hotel bar (and a few others) to relax before another busy day. 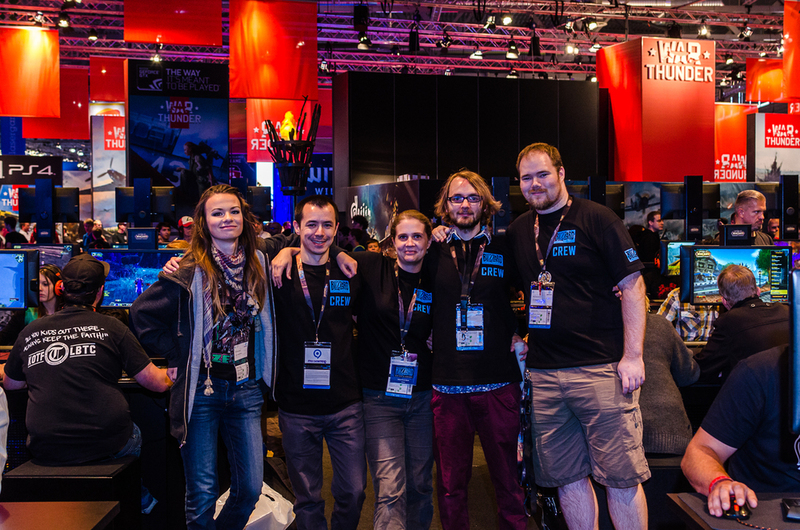 We met some awesome fans along the way, not just of 1 particular game or genre but all games. I loved being able to chat to new and up and coming developers, a few from my old university now doing really well for themselves. Would I recommend going? It's a weird thing to say but if you can work there as an exhibitor or go as press definitely! Even though you are working very hard to ensure everyone has an awesome experience you meet great people and inspire them to continue with their passions and hobbies, be it gaming, cosplay, development or art!